Beautiful job on your quilts. Can’t wait to see your new BOM “…… Season”. Your work is beautiful,and inspiring. The quilting is exquisite. Looking forward to your new project. Applique is my favorite of all stitchery. Thanks. I spend a good part of my life appliqueing!! I don’t know how she comes up with her ideas. The machine quilting adds so much dimension to this quilt that hand-quilting couldn’t possibly do. Your Civil War Bride quilt is really beautiful. I’m a “beginner” quilter, but took an applique class before I took the quilting class. Applique is the motivator that’s driving the quilting. Love it! Your blog is a great inspiration. I know what you mean…sometimes the only reason I get out of bed in the morning is so I can applique. True story!! I don’t know if my comment went through or not,so here goes another try. Your CWB quilt is fabulous – and even moreso now with the quilting. I know just what you mean saying wishing we could see it. The bits I can see are amazing – what a spectacular job she did! Own’s quilt is so sweet! Love how you labeled it. Thanks so much for sharing! I really do wish you could see it! Thanks for the lovely comment! Can you give an idea of cost for the custom quilting of the Civil War quilt? I enjoy your blog…lots of helpful tips and I love to see your progress. I also like the way you laugh at yourself in your YouTube videos..like when you forgot to turn on the light box. Congrats on your two finishes! Wowsers does that machine quilting look good. Wonderful to have someone you can trust with your fabulous work! Looking forward to seeing the next project! I am very lucky. I really do just let Colleen do whatever she thinks would work. I have never been disappointed with her awesomeness! More! More! More! We need to see more of this wonderful quilt. The quilter did a wonderful job, but we need to see it in it’s entirety, it looks so cheerful. I will show a pic of the whole quilt in my next post. 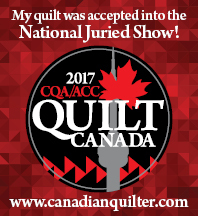 I really wanted to show off the machine quilting! Oh Kerry, your Civil War looks stunning!! Thanks! The quilting really does bring it to life. Appreciate the making letters tip with Illustrator. Civil war bride is over the top. Applique is exquisite. The machine quilting enhances handwork extremely well. Should enter quilt in a show. Pretty backing fabric is perfect. Smart to puchase the bolt. Thanks. I am actually entering this in a competition coming up this summer. Wow, the Civil War Bride quilt is gorgeous!!! Can’t wait to see your new project-apllique rules!! What beautiful quilting on your Civil War Bride quilt. Absolutely stunning! I am still working on my blocks – but this sure is inspiration to continue to work on it and get it done. Congratulations! Thanks! It was definitely a huge undertaking. I am glad to be finished! Your applique quilt is magnificent! And the quilting is perfect! Lovely! OH MY……….sigh………s-w-o-o-n……..someone quick….bring the smelling salts…..I may faint from the overwhelmingly awesome EYE CANDY!!! Aaack, here it is only Monday and we have to wait until next week to see the BOM? I’m sure it will be wonderful, the teaser sure sounds like it. Congratulations on the finishes, each one is very special and you are fortunate to have trustworthy machine quilters who do such beautiful work. Kerry, your work is so over the top beautiful! Your friends at Elite Quilting also do an awesome job. This BOM you’re planning….will you announce it here on the blog? Can’t wait to see it.